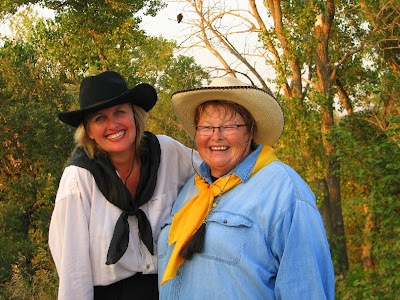 Horsetrailriders.com: It's Cowgirl Weekend Time! In the dark of the winter months, my friend Kathy cheers me up by sending an invitation to “mark the calendar” and come September, attend her annual Cowgirl Weekend. It always seems so far away at the time. It’s like opening a Christmas present and getting just what you want but not being able to wear it until fall! Well, fall is finally here and I am packed and ready for Cowgirl Weekend 2009! My first Cowgirl Weekend was in 2003. Blue was my main ride then. I had never pulled the trailer on my own, let alone taken it hours from my home. Prior to the weekend, John showed me how to hook it up. We pulled the trailer to town and I practiced turning corners and stopping. I even got my first lesson in backing! And I did it! I was mobile! There was no turning back! In 2004, I had been riding Jo the appaloosa that season and shortly before Cowgirl Weekend, he had a sore back from a prior trip. Blue wasn’t legged up, so I took Ginger that year. I’d always been a bit leery of riding Ginger and it was probably the best thing I could have done was to spend a weekend riding her and getting over that fear! I can still feel the wind on my face as I ran her down the dirt pasture road. The following year was Windy’s first summer with me. I was coming off a broken ankle injury and she was just three then and pretty green. I really wanted to take her, but decided on taking both Windy and Blue for the trip. It was good exposure for her but Blue was there for the long days. Windy has been making the trip solo ever since. 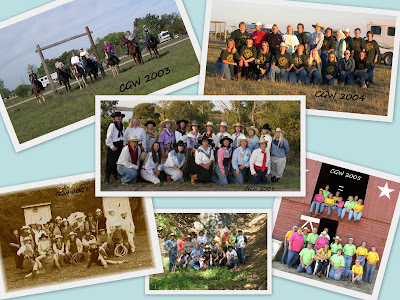 Cowgirl Weekend was started eleven years ago by Kathy Newberg and the late Joyce Vossler. The intent was for women to become more comfortable traveling with their horse, camping with their horse and caring for their horse away from home. It is for spending a weekend with other like-minded women. It’s a time to escape our middle aged body and minds. It’s a time to be silly, a time to be free! And most of all, a time to ride! I’ve grown as a horsewoman since that first Cowgirl Weekend and I thank Kathy for giving me the opportunity to take that first step all those years ago. 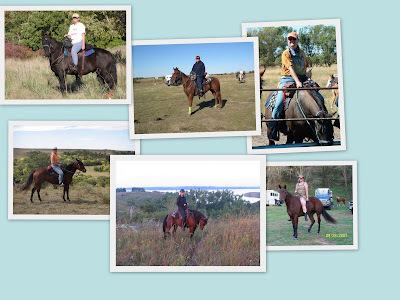 Tomorrow I leave once again at the crack of dawn with my horse in tow to meet 19 other women for Cowgirl Weekend 2009! That's a great idea. Not only does the horse grow, but you do too. It's been years and I still don't feel comfortable backing the trailer! I need a cowgirl weekend! Have a wonderful time cowgirl! Awesome, wish I could go along. Have fun!! I am not all that comfortable towing a trailer yet. My first time was taking the cows to slaughter and I backed up with the help of my friend, but I did It! My boss finally gave me an easier way to do it. Put your hands on the bottom of the wheel and keep them there and move your hands the way you want the trailer to go! I only drive the trailer places where I don't have to back it. :) Someday that's going to get me into trouble! I was 15 the first time I drove the trailer, I was scared to death!!! My Grandpa didnt help any he just sat in the frontseat barking orders, I hadnt driven it since. But as soon as my husband and I said "I do" I was on my own!! No more being coddled, I have to drive the trailer myself, even if my husband is coming. Alas, I'll never forget my first time, and backing still scares the begizzes out of me, oh and you'll never catch me on the interstate, and I wont drive through towns unless I have to, but other then that Im pretty cool driving the horse trailer. Oh and did I mention Im scared to drive it in rain. . . oh and the snow!! Joycee Vossler, was she related to the Vosslers who have 3V in Ashland? Sandhills, can you drive it with horses actually INSIDE it, or is that too scary? Can you get gas while pulling it? Are you able to turn your head and look at the scenery while you are driving or are you stock still, frozen, and by the time you are done, you have a crick in your neck that requires the chiropractor and a lot of Extra Strength Tylenol? I was simply poking fun at myself, but reading over how I wrote that comment I suppose I deserve a little snark. I’m not scared to drive it loaded, we have a six horse trailer and I am perfectly fine hauling it with a full load! Yes I do drive it to get gas; I learned a long time ago that truck stops work a whole lot better than the mom and pop convenient store. I do enjoy the scenery, I’ve been to many beautiful places and enjoyed miles of scenery!! Yes I am still nervous backing it, but I do in fact back the trailer, I back it at shows, trail rides, the vet clinic, I even back out the stock trailer when we haul our cows to the slaughtering house. I Hate snow and rain, but if I NEED to get where I am going I will drive in it, if it’s a matter of choice I’m not so sure I want to ride in the rain and snow anyway, though I'll do it if I have to. Now as for the interstate, I’ve never really driven on the interstate, even if I’m just driving the truck, which is simply because when I lived in Omaha I was in a car accident that nearly killed me on the interstate, so there are some underlying issues there. Snark unappreciated, but maybe I did need to explain myself a little. Im sorry I took your comment wrong, Ive been a little irritable lately, Weve got a new puppy and I belive that I have had three hours of sleep since hes been here. Sandhills, it's easy to take things wrong when they're written online. And a new puppy keeping you up all night doesn't help you to figure out who's being a nut and who's trying to be funny! Have a great day. Sandhills: Yes, Joyce Vossler was Greg's first wife. They lived near Hastings and had 3V Stables there. She died of breast cancer in 2000 or 2001?? Greg & their son moved to Ashland & started 3V Stables there. He has since remarried. I never knew Joyce but I'm friends with both Greg & his current wife, Cindy. I am more white knuckled when my husband is pulling the trailer than when I do. LOL! I have to admit after pulling the two horse most of the summer, I had to get my sea legs about me when I pull the big trailer. I took out the mailbox with it this spring - just forgot what I was pulling (blonde moment). I can back the big trailer a lot easier than the 2 horse bumper pull and much prefer the interstate to 2 lane highways as I do not like passing another car when pulling the trailer but even worse, hate slow pokes! Good topic, all! I'll be posting soon about CGW 2009! I boarded at 3V when I lived in Omaha, they are such nice folks! As for going from a two horse to the big trailer I’m the same way, I pull around my two horse whenever I go to a friend’s place to ride or it’s just me and my two boys, but then when I get to driving the six horse I always seem to forget that I’m pulling it, oddly enough my mailbox has been a victim about three times and the gas station in town has had to replace their diesel pump once because I hit it with the end of the trailer, you should have seen the gas bill that month!!! I think the hubby is rethinking the whole "your a big girl now", guess it beats having to replace the gas pumps, mailboxes, and paying for the repair guy to fix the trailer dents. Tammy, You're an inspiration, my friend. You are living your dreams, and we can all aspire to do the same.